We are all astonished when we watch professional golf events on TV, and see Dustin Johnson or Rory McIlroy routinely hammer their drives well over 300 yards. In fact, on today’s PGA tour, almost all of the pro’s hit the ball incredible distances with their drivers. Hitting 7-irons into Par 5’s after a 340 yard drive? Hitting pitching wedges from 150 yards out? It’s clear that the pro’s place a huge premium on distance. In fact, unless the rough is unusually punitive, they would usually rather hit their drive 300+ yards and risk missing the fairway than to hit it 270 yards down the middle. These guys have determined that golf is an easier game when you can hit shorter clubs into the greens. Well, that theory applies to us, too. Let’s face it, though. For most of us, it is highly unlikely that we will ever be able hit our drivers anywhere near the distances that the tour pro’s do. They are obviously extremely talented athletes who have near-perfect swings, do weight and flexibility training every single week, and have customized equipment that optimizes their launch angles and spin rates. But even if you aren’t able to keep up with Dustin Johnson, you’d be happy to pick up, say, 10 more yards on your drives, right? And you’d be absolutely thrilled to gain 20 or 30 yards! The quest for distance with the driver is universal in golf, whether it’s by a PGA pro, or by an amateur weekend golfer who just wants to keep up with, or outdrive, buddies in the weekend foursome. Young or old, amateur or professional, we all want to hit it farther. So how can I gain extra yards off the tee? There are several basic tenets of the driver swing that should be understood and put into use by all golfers, but particularly by those seeking more distance. And they occur throughout all phases of the swing, starting with the setup. Although implementing some swing changes can be difficult at times, the one area that everyone can “get right” is the setup. It doesn’t take any special talent, technique or strength to set up properly to the ball, in a way designed to assure that you maximize your distance. To establish a solid foundation, make sure that your feet are positioned a little wider apart than your shoulders. Too narrow of a stance can lead to swaying during the swing, which can cause a “power leak” and cost you distance. At your address position, tilt your upper body slightly to the right. This will encourage you to swing “up” at the ball, the importance of which is highlighted in the next paragraph. In terms of weight distribution, you should feel that there is slightly more weight on the right foot than the left, perhaps a 55%/45% distribution. This again is designed to get you to feel slightly “behind” the ball, making it easier to hit with an upward angle of attack. This is one of the most overlooked keys to get properly set up for distance. The ball MUST be forward in your stance, across from your left heel. Even farther forward, off your left toes, would be acceptable. But in no circumstance should the ball ever be positioned further back in the stance than that. Why? Because, as mentioned above, one of the essential swing ingredients to generate maximum distance is an upward “angle of attack” into the ball. As your club head approaches the impact zone on the downswing, it must be on an upward trajectory as it approaches the ball. This upward motion will produce a higher launch angle on your shot, and will apply less spin to the ball. That is the magic combination to long tee shots: high trajectory and reduced spin. With the ball forward in your stance, and your spine tilted to your right, it is much easier to swing so that you catch the ball on the upswing. By contrast, a ball positioned too far back in the stance, will encourage a downward angle of attack, which tends to produce much more spin, a lower launch angle, and reduced distance. Interesting fact: With a 100 MPH swing, a driver swing arc that approaches and strikes the ball on a 5 degree upward angle, will produce a drive that is 30 yards longer than a ball struck with a 5 degree downward angle! Move that ball position up in your stance and capture those extra yards. To further encourage hitting up on the ball, make sure your ball is teed up high enough. At a minimum, half of the golf ball should be above the crown of your driver head when it is set down next to the tee. Some long hitters go much further than that. The next time the Long Drive Competition is on TV, check out the tee heights that these golfers use. In most cases, you will see the full ball visible above the crown of the driver. This makes it impossible to hit down on the ball, and avoids all of that excessive spin that is a killer to distance. A ball that is teed too low invites a downward angle of attack. This is a difficult concept for many amateur golfers to accept. Subconsciously, they assume that, to generate maximum club head speed and distance, they need to exert as much effort and force as possible. In so doing, their wrist, arm, and shoulder muscles tighten up as they strain to swing the club harder. Other than simply being a false assumption, this tensing of the muscles often serves to produce several swing mechanics and sequencing errors. Simply put, tight muscles are antithetical to producing faster swing speeds. Distance is not about strength. I’m sure you’ve all seen that skinny, 5’ 7” teenager on the driving range, who probably can’t lift 100 pounds, hit those long, booming drives. It’s clearly not effort and muscle that allows him to do that. One of the most detrimental errors made by golfers that try to swing too hard and exert too much effort, is the all-too-common “over-the-top” swing. Without going into too much detail here, coming over-the-top is a swing plane flaw in which a golfer allows the upper body to take over in the start of the downswing. This can cause the club to be thrown out and away from the body, forcing it outside the proper swing plane, resulting in an out-to-in swing path into the ball. The result: the dreaded slice. We all know how much distance can be lost when the ball curves wildly from left to right rather than flying straight down the fairway. 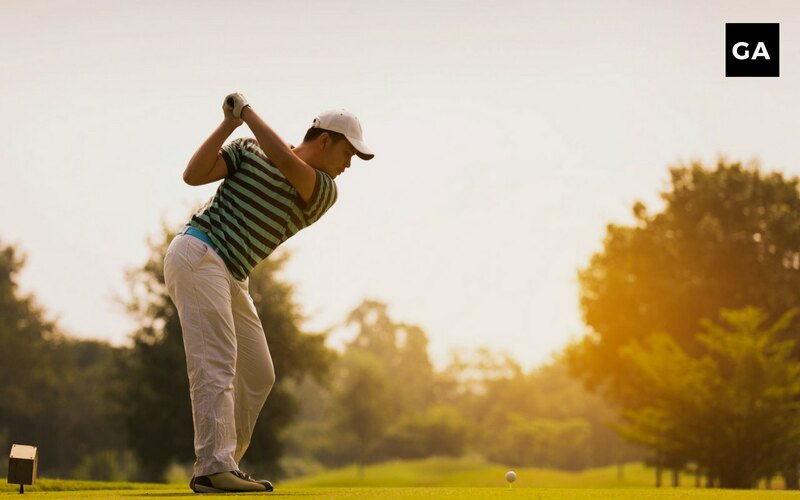 There are many issues that can cause an over-the-top swing, but clearly one of the more common causes is muscle tension from trying to swing too hard. A key to eliminating this excess tension is to focus on slowing down your takeaway (“low and slow”), making sure to have a slight pause at the top of the swing, and allowing the lower body to initiate the downswing, rather than yanking the club from the top by using only your upper body. While you’re doing this, focus on keeping your hands, wrists, arms and shoulders loose and relaxed. If you are a player that struggles with a slice, there is a good chance that an over-the-top motion is the culprit, and is costing you yards. We’ll deal with this topic in more detail in future articles. A surefire power leak occurs when golfers reduce the width, or radius, of their swing arc. This happens when, during the backswing, the hands are brought closer in to the body than they should be. With this collapse of the arms, the width of the swing decreases. Trying to widen the swing is a key part of hitting longer drives. As an analogy: if a pitcher were to throw a baseball starting with his arm fully bent at the elbow and the ball right next to his shoulder, he will generate much less speed than if he rears back with his arm extended behind him creating a wider throwing motion. The same holds true in the golf swing. Golfers often allow the arms to collapse inward during the backswing, shortening their swing arc….along with their drives as a result. Collapsing of the arms during the swing is often accompanied by a shortening of the shoulder turn. Very flexible golfers can achieve shoulder turns well in excess of 90 degrees. Most of the rest of us can’t. But, regardless of the amount of flexibility you have, it is important that you make an effort to get as full a shoulder turn as possible. This will lengthen the swing and will produce longer drives. Almost everyone nowadays has an adjustable driver. If you don’t, you may want to consider investing in one. Adjustable drivers allow you to change the loft on your driver by as much as 3 to 4 degrees. As we discussed earlier, getting a high launch angle is a key to longer drives. This is a simple adjustment you can make to zero in on your optimal launch angle and get an instant yardage increase. Similarly, these clubs allow an adjustment to the “face angle.” If you tend to slice the ball off the tee, you can close the clubface somewhat to minimize that left to right ball flight. If you tend to hook the ball, adjustable drivers allow you to do the reverse and minimize your right to left ball flight. If you already have an adjustable driver, these adjustments are a free and easy way to add distance. All it takes is some experimentation and tinkering on the range to dial in the right settings for your swing. It is not uncommon to see gains of 10-15 yards simply by correcting driver settings that are not optimal for your particular swing. Distance is the holy grail for most golfers. By first understanding the setup or swing issues that may be causing power leaks in your swing, as we outlined here, you are now able to make some changes or adjustments that should help you gain that valuable yardage off the tee and increase your drive distance. Golf gets a lot more easy and fun when you’re a little farther down the fairway!